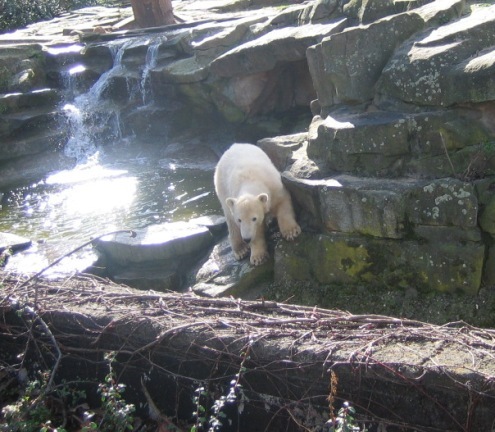 The third and the last day of our Berlin visit started with sunshine and we really enjoyed our walk to the zoo. We had been a bit wiser and bought our tickets the day before to avoid queus. We headed straight away to Knuti – who else? Knuti was napping but Nene was there with a lovely lady who introduced herself as Gudrun, Simones mother. Again I felt like meeting an old friend!! We chatted for some time about this and that but especially about the PICTURE. Since Nene couldn’t stay very long Gudrun promised to take care of the photographing. 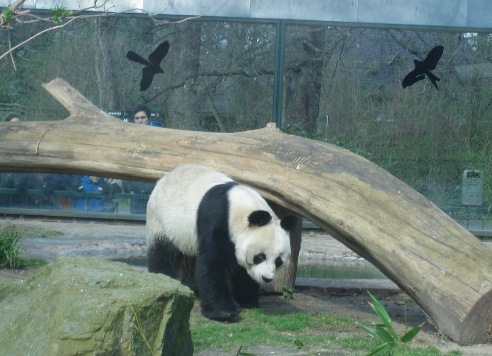 Because Knuti was still sleeping and having his well earned rest we decided to go and visit Bao Bao. 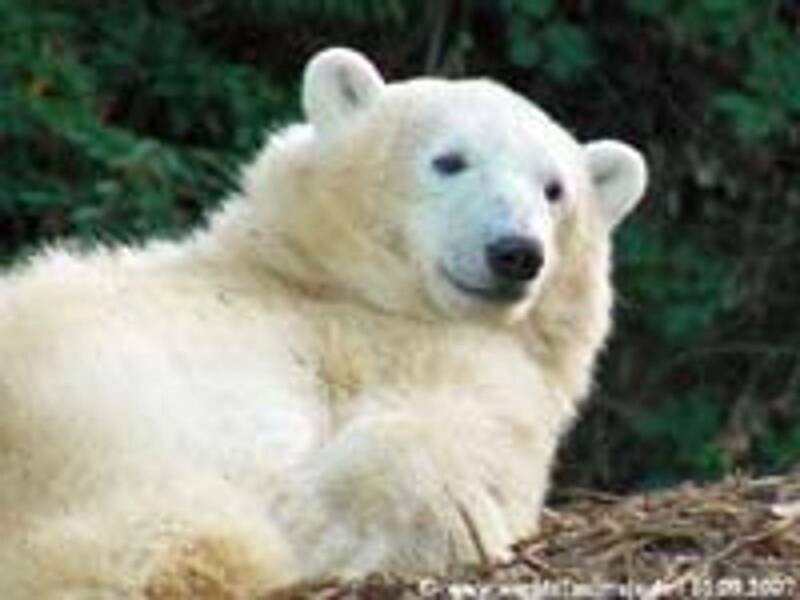 I have been a godmother for pandas and polar bears for years so of course, I wanted to meet my black and white friend again. Bao Bao was waiting for his food and when it came he sat down holding his food very elegantly in his paw like he always does. This panda is a beauty! 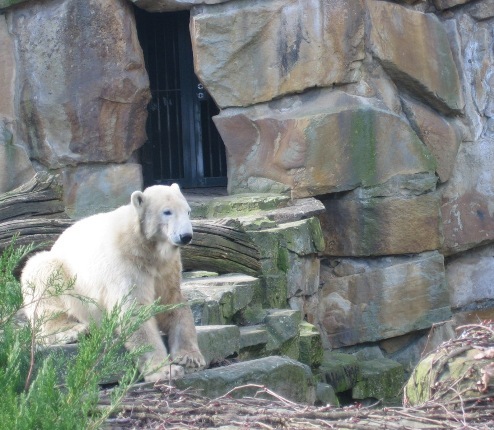 When we were slowly walking back to Knuti’s enclosure we met Sylvia, Uschi and Claudia? (I’m sorry I’m not sure about the name). New faces – new dedicated Knutians! Gudrun, Vesa and I went to the café to drink something hot before going back to our fluffy fellow. Knuti was awake now and gave his climbing show again. He’s amazingly agile and he looks so proud when he has reached the ‘top’. Waving to the public is something he does between the climbing rounds just like he wanted to say ‘thanks for watching the show’! I was fascinated by Knuti but I was also very excited to meet a special Knutian – Teddybärenmutti from Finland who should be arriving any minute now! SpreewaldMarion joined us, too, and she became also involved in the big project: the PICTURE! It began to be very cloudy and chilly – we hoped it wouldn’t start raining. Well, it didn’t start raining – it started snowing! What an Eisbeer Wetter!! I hadn’t met Teddybärenmutti before – the only thing I knew she has black hair with a red stripe so I was keeping on eye on all women with black hair. Suddenly I saw someone taking pictures of Knuti and I knew it was ‘Mutti’. I ran to say hello to her and the ‘whole family’ followed me. Of course we just had to speak a little Finnish first but then we remembered our manners and proper introductions were made in both German and English. 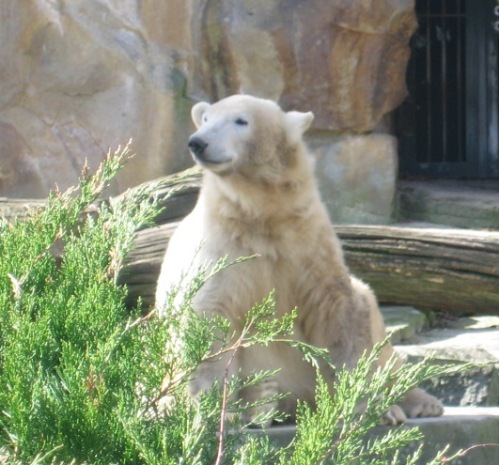 We stayed at Knuti’s enclosure and admired our friend who looked so happy having so many visitors! He is funny, charming and touching – everything at the same time. I began to feel a little melancholic knowing that this is my last day in Berlin and I don’t know when I’m going to see Knuti again. Although, thanks to all the photos and zoo reports I never feel I’m so far away from him. I want to thank all the photographers and zoo reporters once again! Gudrun and SpreewaldMarion suggested we should go and see the wolves’ feeding and after that it was time for what I’ve been waiting for since December! Can you guess what I mean?? Oh, it started snowing again…. When the wolves had been served their dinner Gudrun said: ‘Now it’s time to go and meet TD before there will be too many people around him’. All I could think about was that my hair was a mess after all snowing and my mascara was running down on my cheeks. 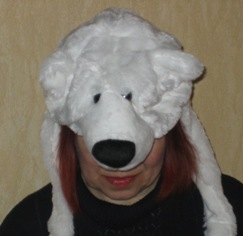 I was sure I looked like a redhaired panda! Then I told myself ‘this is no time or place for vanity, don’t be a sissy’! 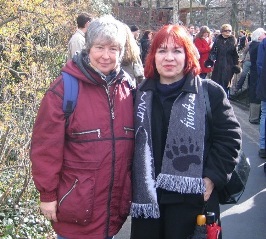 So off we marched – Gudrun and Marion leading the troup. Then we saw TD coming towards us and my heart was beating like I-don’t know-what…imagine if he says no…Now it stopped snowing and the sun was shining again! Gudrun asked TD if she; Marion and Vesa could take some pictures of him and me together and he said ‘yes, of course’ and smiled like only he can smile!! I have met some famous persons but not one of them has been himself/herself – they are playing a role all the time. TD is just TD. I wonder how many aunties have been photographed with him but he managed to make me feel like this was a special occasion even for him. He doesn’t DO anything – he just IS a nice chap! Not a sign of a bored face showing the ‘oh no, not another Wild Herder’ look! Die Hoffotografin Gudrun is instructing the models! Notice her lovely bag!! 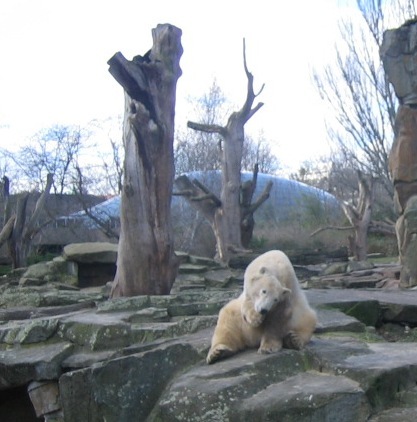 After the pictures were taken Teddybärenmutti wanted to ask something about a ball to Knuti but she will tell you more about this in her own report which I hope will be on Knutitours site before long! Gudrun told me to speak to TD as well but I felt so empty in my head that I just couldn’t think of anything to say – I mean anything that would make any sense. When do I become a serious adult??? Autographs!!! We must have autographs, too, but we forgot to buy cards…Not to worry, Marion ran to the souvenir shop and came back with a couple of Knuti’s birthday cards and TD signed them. Oh joy, what a day!! I will never forget the 19th of March 2008. I’d like to make it a National Holiday in Sweden. Remind me to make a proposition of it!! It took some time to calm down in front of Knuti’s enclosure where we watched the feeding. Knuti didn’t have any problems with his apetite - he seemed be very satisfied with the menu of the day! Now the sad moment was near - soon I had to say goodbye to all our wonderful friends. Teddybärenmutti and her husband left the zoo and we left, too, some minutes later. It was time to wave goodbye to our darling Knuti. It was difficult not to start crying and my hubby told me to ‘let it come, I understand you’re sad leaving Knuti and your friends’. Bye, bye Mervi and Vesa, I hope we'll meet again soon! In the evening Teddybärenmutti and her husband joined us for dinner in the Italian restaurant that allows smoking (VERY important!). They serve really good food, too. We had such a good time that it was quite late before we realized we have to get some sleep before the journey back to Sweden! Vesa and I want to thank all the Knutians for a wonderful time in Berlin. 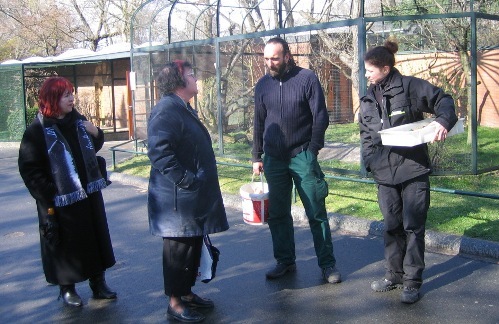 Our special thanks to Dumba, Nene, Gudrun, SpreewaldMarion and BarbaraBerlin who took such good care of us at the zoo. You made us feel like real VIKs (Very Important Knutians). 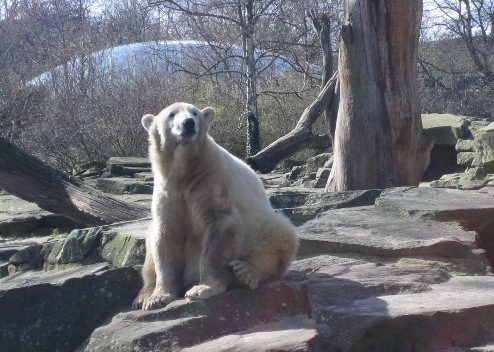 You are the best ambassadors for the Zoo, for Berlin and for Germany! I wonder if the director at the zoo is aware of what a wonderful (volunteer!) job you’re doing when you guide other Knutians, help them with pics and autographs, answer a lot of guestions…. Thank you for your hospitality! DANKE SCHÖN! 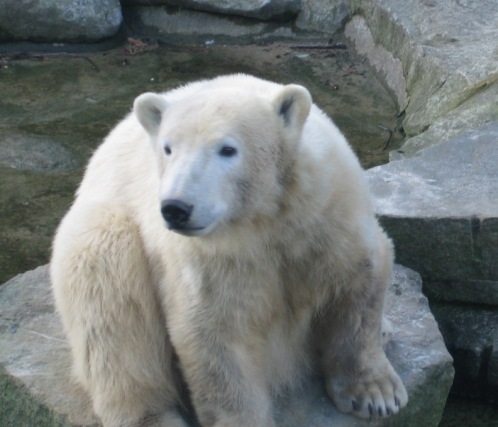 This was my third visit to Knuti and my friends keep telling me I’m starting to look like a polar bear. I haven’t notices any signs of that. Have you?? ?